The Learning Ecosystem Solution, delivered by Good e-Learning, allows businesses to manage and deliver training programs through a market-leading cloud-based LMS platform. When used in combination with Good e-Learning's tailored eLearning services, the platform enables organizations to roll out company-wide training programs. However, the success of such programs relies on the ability for managers to monitor and control progress and to show the value of investment to stakeholders. To achieve this, we combine a powerful reporting engine with consultancy services to deliver a bespoke reporting package. It may be important to monitor the performance of a specific course, for example as part of an organization-wide compliance initiative. 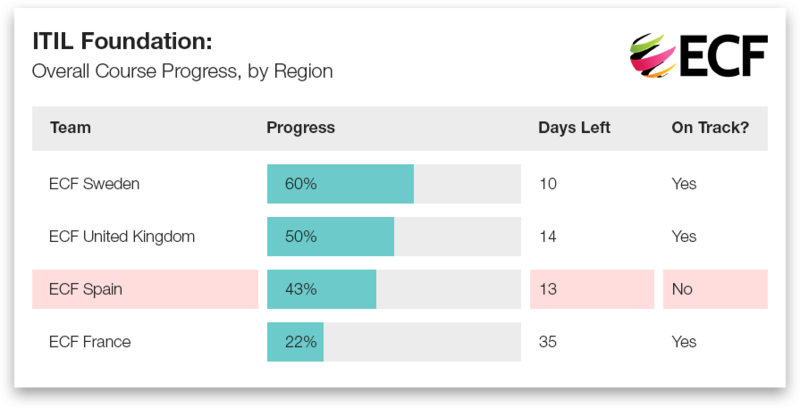 In this example, the reporting view provides instant visibility of performance across different regions in the organization. Most importantly, it shows managers whether each region is on track to complete the required training within the time period set by the business. This enables managers to take appropriate action with students that are behind. Some businesses wish to implement broader training programs for teams, functions or regions. In this example, we can see a custom report that aggregates multiple sources of data to show overall student progress of different types of training as part of a wider Training initiative. A key objective for a Learning Ecosystem Solution may involve the achievement of external certification exams, as part of a skillset development initiative. In this reporting example, we combine course completion data with external exam score data to provide clear tracking of certifications, and the benchmarking of pass/fail rates. Book a FREE Demo with a Consultant!